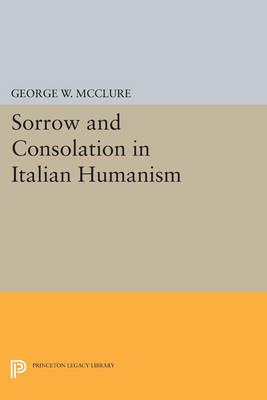 George McClure offers here a far-reaching analysis of the role of consolation in Italian Renaissance culture, showing how the humanists' interest in despair, and their effort to open up this realm in both social and personal terms, signaled a shift toward a heightened secularization in European thought. Analyzing works by fourteenth-and fifteenth-century writers, from Petrarch to Marsilio Ficino, McClure examines the treatment of such problems as bereavement, fear of death, illness, despair, and misfortune. These writers, who evinced a belief in the legitimacy of secular sadness, tried to forge a wisdom that in their view dealt more realistically with the art of living and dying than did the disputations of scholastic philosophy and theology. Arguing that consolatory concerns helped spur the revival of classical schools of psychological thought, McClure reveals that the humanists sought comfort from once-neglected troves of Stoic, Peripatetic, Epicurean, Platonic, and Christian thought. He contends that the humanists' pursuit of solace and their duty as consolers provided not only a forum but perhaps also an incentive for the articulation of prominent Renaissance themes concerning immortality, the dignity of man, and the sanctity of worldly endeavor. Originally published in 1990. The Princeton Legacy Library uses the latest print-on-demand technology to again make available previously out-of-print books from the distinguished backlist of Princeton University Press. These editions preserve the original texts of these important books while presenting them in durable paperback and hardcover editions. The goal of the Princeton Legacy Library is to vastly increase access to the rich scholarly heritage found in the thousands of books published by Princeton University Press since its founding in 1905.